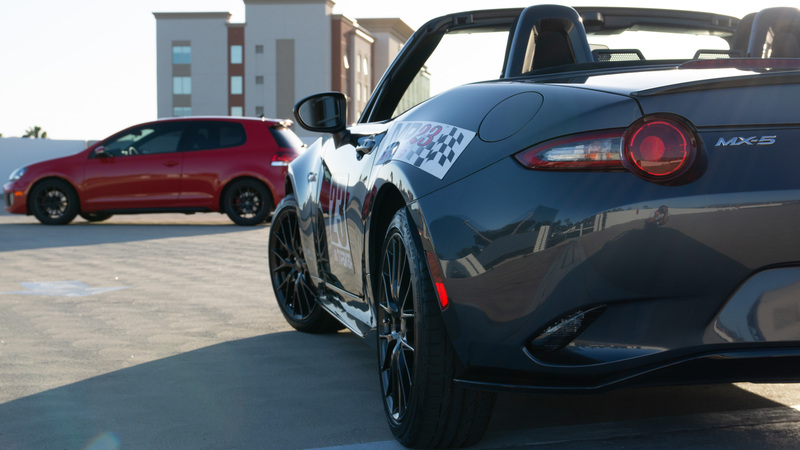 The first race with my '17 Mazda MX-5 Miata on the fresh off-the-mold Bridgestone RE71R's. The results weren't bad, but there were definitely some interesting moments on the day. The day was already made special when my cousins, and of course my beautiful wife, were able to come down and witness the world of autocross that I've been living in for the past 6 years. They were able to get some great footage and photos of me in my 3rd race in the new roadster, but first on the new tires. Check out that footage and other cool content by @anewyorkstory, @amazinglifeofm, and @aubreelise on Instagram! It has been a month since the last Cal Club autocross and I was definitely itching to get back on course with the Miata. The Bridgestone RE71R's were installed and extremely green (i.e. never touched the road until this race). I was already familiar with the grip levels of these tires in this condition from just a year ago in my 2012 VW GTI in a Match Tour Race in San Diego's Qualcomm Stadium, and the results were very pleasing as can be seen from my reaction at the end of my final run. So getting into the race, my first run went very smoothly and I did not have any mistakes which allowed me to take the early lead of 4 with a 55.991 sec run. Tom Frecentese, whom is the current C-Street leader in Cal Club, is the competitor I was battling all day for the win. He landed a 55.646 but had a cone which brought a 2 second time penalty. So by raw time, he definitely had me, but needed to stay clean for it to count. I was nodding my head at my first run as I felt good in the car. I will later realize that feeling good and comfortable means that I am not pushing this car to its absolute limits yet. Moving onto run 2 of 4, I decided to change a few things related mainly to my shifting on course to try and maximize as much speed in each gear. This course was very smooth in-terms of driving line, but had key elements at the brink of the rev limit in the ND Miata which caused some serious consideration for me on shift points. This run would turn out to be slightly slower than the first by 0.070 seconds but with a cone penalty. It wouldn't matter since it was a slower raw time anyway, but this would be the beginning of a bad day in-terms of mental mistakes made on course. Tom also made some mistakes on his 2nd run, so at this point I was actually still in the lead. Run 3 of 4 was where things got interesting very quickly in the first 10 seconds into the run. As I was accelerating out of the early slalom section, toward the chicane, I decided to shift up to 3rd beforehand to try and carry that speed into and out of that corner. The issue was, I ended up hitting 5th gear and by quickly trying to get back into 3rd, I missed my turn-in by a fraction of a second with the addition of carrying too much speed into it. I ended up losing the rear end, but caught it which induced a reaction in the other direction for which I had to catch again quickly or the corner workers would have had a rough day cleaning up that section. All of that craziness can be found on my Instagram page @mp23racing. I ended up blowing the lap early, and just made it across the finish with a 58.516 sec run. This would obviously not be the fastest of the day, and at that time, Tom had laid down a clean 55.412 sec run. This would propel Tom into the lead, with me trailing by 0.579 seconds from first place. On the final competition run, I wanted to try and fix one too many things at once, and I really just needed a fast and clean run. I definitely felt I could better my first run time of 55.991 so I decided to leave my shift points the same as what I was trying to do on my 3rd run. I made it through 60% of the course until I hit a cone on the exit of the chicago box corner right before the long right hand sweeper. At this point, I already knew the run was a bust and I would not be able to contend for the win. I did come across the line with a faster raw time (55.720), but this would not have taken the win regardless of the cone being hit. I will say it was a very annoying day for me since I knew the speed was there, but I did not take full advantage until I drove during extra "fun" runs in the afternoon where I knocked off nearly 0.9 seconds from my fastest competition run. All that can be taken away from a loss are the lessons learned, and how to apply them for the future. I just know that with the National Championships coming in less than two months, I need to isolate these mental mistakes and start driving more aggressively since the platform is so much different than my previous heavier FWD autoX car. This next Cal Club race in August will be a wake up call for sure, but I will be ready! The new re-launch of the website means better organization and functionality across devices, and the ability to provide much more premium content at a more consistent rate than was previously achievable. about our new projects and updates.